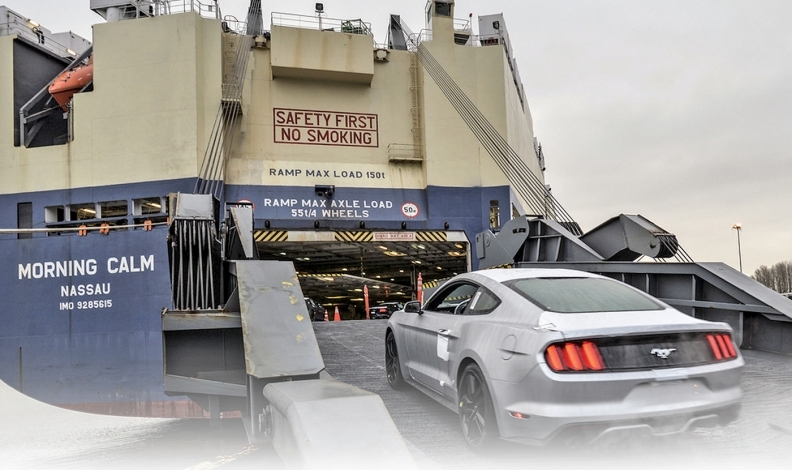 A U.S.-built Mustang is loaded on a freighter headed overseas. Customers in England and Australia face backlogs of at least six months for a new Ford Mustang. In Germany, the Mustang has attracted more retail buyers this year than the home-country favorites Audi TT and Porsche 911. And in the U.S., the Mustang is not just beating, but downright pummeling, the redesigned Chevrolet Camaro en route to a second consecutive title as the nation's top-selling sports car. Ford Motor Co.'s 2014 overhaul of the Mustang, which included opening sales in 81 more countries to turn it into a global halo for the automaker, is paying off. Demand has been especially heavy for the first-ever right-hand-drive Mustang, which went on sale late last year in 25 markets where the car had been virtually off-limits previously. Ford said it has sold about 27,000 right-hand- drive Mustangs since production started a year ago. 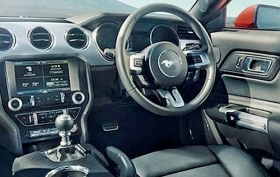 "Mustang has been a huge success for us," Colin Massey, general sales manager at Jennings Ford Middlesbrough in northeastern England, said in an email. "We are still seeing a steady demand for the Mustang and are currently averaging between three and four orders per week." Ford has a backlog of seven months for the Mustang with a four-cylinder EcoBoost engine and nine months for the V-8 version, Massey said. The wait has been up to 10 months in Australia, where the Mustang is now Ford's second-biggest seller, behind the Ranger pickup. "We are always trying to eke out one more right-hand-drive unit if we can," said Carl Widmann, the Mustang's chief engineer. "We've exceeded expectations overall. We're getting happy customers across a lot of different regions." Ford has sold more than 20,000 Mustangs in Europe, including about 4,400 in the United Kingdom and nearly 6,000 in Germany, since shipments there began nearly a year ago. Ford said it's the most popular car in the U.K. that's rated at more than 250 hp. The Mustang is the top-selling sports car this year in Saudi Arabia, the United Arab Emirates and South Africa as well, Ford said. The Mustang is Germany's top-selling sports car this year among retail buyers, according to government data, and it was the overall sales leader in February and March. About one in three German sales are the convertible, and most buyers there choose the 5.0-liter V-8 engine, Ford said, in contrast to the rising popularity of the car's V-6 in the U.S. and despite much higher gasoline prices there. "That unmistakable V-8 warble is a hot commodity outside the U.S.," Ford sales analyst Erich Merkle said in a statement. Ford says it has sold about 27,000 right-hand-drive Mustangs since output began a year ago. Sales have topped 3,300 in Australia and 3,800 in China, a Ford spokesman said. Before last year, the Mustang was sold in North America and a few dozen other countries, where sales were minuscule. Getting it anywhere else meant working through private importers and, if necessary, making a costly conversion to right-hand drive. The latest generation was designed to have more global appeal, with more European styling and an independent rear suspension instead of a live axle, a change that upset some traditionalists. Today, overseas markets still account for a small fraction of the Mustang's total sales, with about 80 percent of the cars -- all built in Flat Rock, Mich. -- staying stateside. But Ford sees the Mustang's growing presence in more than 100 countries outside North America as a way to evangelize its brand to consumers worldwide. "The visceral look, sound and performance of Mustang resonates with people, even if they've never driven one," Ford's global product development chief, Raj Nair, said in 2014, when the car marked its 50th anniversary. "Mustang is definitely more than just a car -- it is the heart and soul of Ford." While the Mustang finds its footing in new markets overseas, it's blowing away the competition in the U.S. It overtook the Camaro last year for the first time since 2009 and hasn't looked back, even as Chevy rolled out the sixth generation last fall. The Mustang's share of the midsize sports-car segment, which also includes the Dodge Challenger, has surged from 37 percent in 2014 to 46 percent so far this year. Through August, the Mustang leads the Camaro in the U.S. by nearly 33,000 units, a margin so large it might stand up even if Ford took the rest of the year off. Mustang sales here are down 6.8 percent, to 80,829, mirroring a downturn in car sales overall, but the Camaro's decline is more than twice as steep. Incentives are part of that difference; Ford increased Mustang incentives by about $500 this year, to $1,535 through July, while Chevy reduced Camaro discounts by about the same amount, to $2,246, according to Autodata. In addition, Chevy deliberately moved the Camaro more upmarket with the latest generation, discontinuing the base LS trim. The sticker price for the Camaro now starts at $1,755 more than the base Mustang. Chevy also is selling fewer than 10 percent of the cars to fleet buyers. "For us, it's about the right volume," said Todd Christensen, GM's marketing manager for the Camaro. "Would we like to be the sales leader? Yes, but not at the detriment of other things."